Of all the impressive quarterback performances we saw this weekend, one really stood out to card collectors on eBay. Cam Newton shredded the Arizona Cardinals in a loss, throwing for 422 yards and two touchdowns. The Carolina Panthers still lost 28-21, but people are mostly talking about Newton's performance in that game. He just made it look easy at times. Even though he lost in his debut, the big winners are the people owning his cards right now. Prices have gone a little crazy in the past couple of days. Can you blame anyone owning football cards for throwing them up on eBay? This 2011 Leaf Draft Day graded card is more than $12 with a little under a half hour to go. I feel like this card was graded in someone's basement. 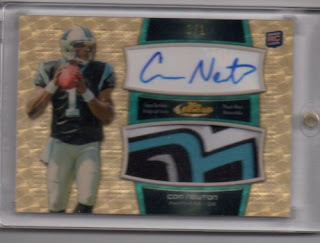 But the auto to really watch is the Cam Newton Topps Finest Superfractor patch/auto RC. With five days to go, the cards is at $1,700 with 29 bids.